Medidata is a small player that's been winning over clients and lowering costs to bring drugs to market. It's no secret that if there's one expense that's been growing out of control in America, it's health care. Depending on who you ask, the amount of money Americans spend on health care has grown by almost 10% per year -- for 50 years -- far outpacing inflation or GDP growth. While this is no doubt a cause for major concern, it's important to note that several companies have popped up that offer to help health-care companies bring down their operating costs -- with the hope of those savings being passed on to us citizens. 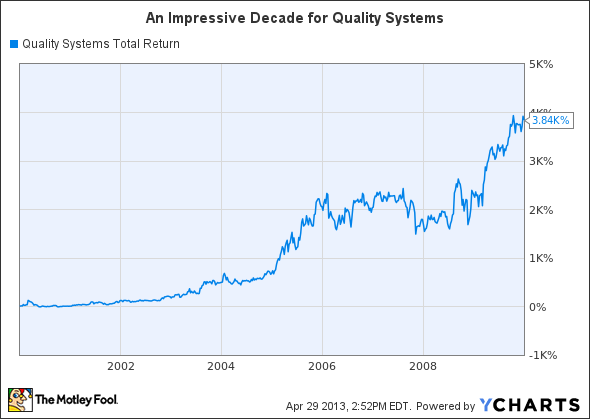 For instance, Quality Systems (NASDAQ:NXGN) stock made huge moves in the aughts. The company designed systems to help doctors and dentists transition their record-keeping services to one easy-to-use electronic database. The move helped bring down costs for doctors, and certainly rewarded investors between 2000 and 2010. For a more recent example, look at Athenahealth (NASDAQ:ATHN). Every year, almost $800 billion is lost due to medical billing errors. Enter the company's AthenaCollector system for smaller medical practices. The company helps keep health-care costs in check by keeping doctor's bills paid. In the meantime, its also has treated investors to a 300% return on their investment since mid-2010. I offer those two up as examples that this trend of profiting while helping medical companies save money, is very real. The company I'd like to introduce you to today is much smaller: Medidata Solutions (NASDAQ:MDSO). Medidata offers a one-stop-shop for drug companies by providing a platform -- dubbed "Rave" -- to track and analyze all of the complicated steps of getting a drug approved by the FDA. This process can be an incredibly arduous and expensive one, as only a small fraction of potential drugs ever make it to market, and those that do often take years to get there. By signing up with Medidata, companies will make the process considerably more manageable. And judging by the company's increase in its customer base, the medical community is becoming well aware of these benefits. Among those customers are some big hitters. AstraZeneca joined Medidata's customer list back in 2006. Bristol-Myers Squibb re-upped their contract in 2009. And, in 2011, GlaxoSmithKline decided to use Medidata's "Designer" for clinical research and development. But that doesn't mean there isn't still room for the company to grow revenue. As customers get locked into Medidata's ecosystem, the switching costs become much higher. And as time goes on, Medidata will be offering more and more tools to help companies drive down the costs related to bringing drugs to market. Earnings released earlier this week wowed Wall Street, as the company easily beat earnings expectations, and raised guidance for an even stronger 2013. I'm still getting familiar with Medidata, but I think there's definitely potential here. I love that the company is still run by its co-founders, as they have clearly built themselves an impressive record of creating value for -- and winning over -- clients. The company now trades for about 57 times earnings, and 250 times free cash flow, so it's by no means cheap; but, sometimes, the best companies never are. Investors need to carefully weigh the price against the company's opportunity before buying in.